Ever use a fire extinguisher? Most people haven’t, and therein lies the problem. Operation is simple and straightforward, but learning a bit about extinguishers and suppressing flames now is a very good idea. Think of today as the ideal time to start learning. Fires with different fuel sources burn differently. Wood, cloth and paper are solids known as Class A combustibles. Flammable liquids and gasses, such as gasoline and propane, are Class B. Electrical fires are Class C. (Never use water to extinguish an electrical fire for fear of electrocution.) Flammable metals are Class D and not a likely fire source in the home. However, oil and grease fires, known as Class K (think kitchen cooking fires) are common home fires, so let’s deal with them first. Class K fires will explode if water is used to fight them, so always avoid the impulse to throw water on these fires. If it’s grease in a pan, quickly cover the pan with a lid of equal or larger size to eliminate the fire’s source of oxygen. No lid available? Grab baking soda and pour liberally over the pan and any grease. Remember that if grease is smoking, it is already too hot. The flash point of a grease fire is 260 degrees Celsius. Grease will smoke furiously before it ignites, so if you notice smoke, turn the heat down immediately. Pull the pin first to allow the trigger to be squeezed. Aim the nozzle low to the base of the fire to smother flames at their source. Spraying toward the tops of flames with the extinguisher won’t be effective. Squeeze the trigger to release the agent evenly. Sweep the nozzle from side to side until the fire is out. Keep aiming at the base while you do so. Most extinguishers will give you about 10-20 seconds of discharge time. Is the fire out? Don’t celebrate yet. Just slowly back away. Even if the fire appears to be extinguished, don’t turn your back on it. Unseen hot spots or hidden fires can reignite to create a large flame at any moment. So be careful. Fires are very fickle. Fire extinguishers aren’t always a legal requirement for homes. However, it’s just crazy and dangerous not to have fire extinguishers and sufficient smoke detectors in your home. At a minimum have one ABC extinguisher per level of your house. Take a peek every so often at the extinguisher to see if its pressure is in the green zone and that seals haven’t been broken. 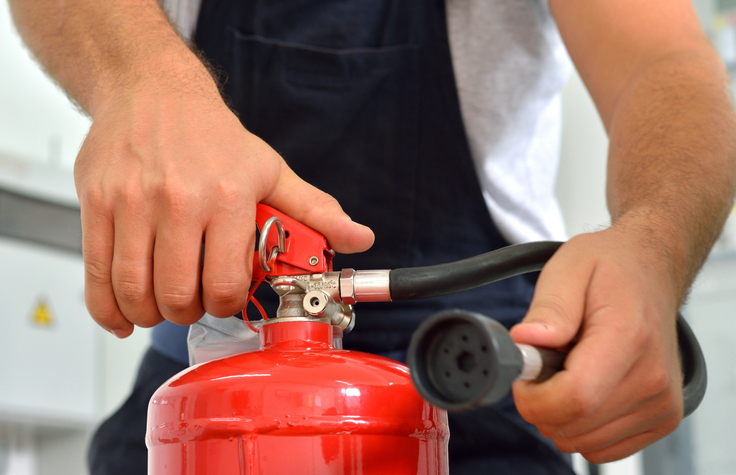 If you see damage — dents, a torn hose, or rust — replace the extinguisher immediately. One last recommendation. If the fire’s flames are taller than you, choose flight over fight! Leave immediately and call 911. Your fire extinguisher will likely be no match for large flames. Paul Davis provides professional residential and commercial emergency cleanup and restoration services for fire and smoke damage and for other disasters of all sizes. From fire damage to flood damage, Paul Davis professionals are available 24/7. This is no time for second bestTM.